In the Old Testament God sent prophets to turn people and nations from destructive behavior. Prophets spoke the word of the Lord to God’s people, not to judge them, but in hopes that they would return to Him. God is faithful to send prophets to warn His people so destruction and consequences can be averted. In my understanding, it was rebellious behavior that caused destruction. God’s heart was not to judge His people but rather instruct them because He did not want them to continue to live in destructive behavioral patterns. One such prophet is Isaiah. Isaiah was sent to God’s people during a time when God had taken a back seat in the hearts of His people. Isaiah used strong words describing the malady that was affecting the Israelites: your country is desolate, the whole head is sick, sin and rebellion are bringing on disaster, and Jerusalem is filled with filth. He described a society being decimated by moral perversion, relational and religious hypocrisy, confused families in which parents had lost control of children, and countless other problems that were the result of corrupt living. The irony is that even though this behavior was happening and the account of Isaiah’s prophecy was written thousands of years ago, it is as if we are watching Headline News today. Violence, perversion, addiction, rebellion, confused families, relational and religious hypocrisy, political hypocrisy, suicide, depression, disease and disaster are not just daily occurrences but are happening minute by minute. Isaiah is speaking to people just like you and me who are trying to cultivate roots, raise a family, develop a career and live a life of vibrant faith. If Isaiah’s first forecast was the whole story, it would appear that the prospects for us to have a house of glory in our time are as bleak as they were in Isaiah’s time. However, Isaiah had a second word, a brighter hope for a better future. He spoke of that day when Messiah comes and through Him that God would rebuild society by redeeming people and their homes. This promise is packed with remarkable promises from God. And what is most remarkable is that Isaiah prophesies that there would come a day in Messiah that the glory of God would be right here in our homes. When we are talking about “The Branch,” we are talking about Jesus, the Messiah. “Zion” is also important because it is not only a geographical place it is also the name for God’s people. “Awake, awake, put on your strength, O Zion; Put on your beautiful garments, (Isaiah 52:1).” “Praise the Lord, O Jerusalem! Praise your God, O Zion! Zion Where Gods people gather, (Psalm 147:12).” “A Branch shall spring forth,” “a Branch shall bring this to pass,” “everybody in Zion shall be covered in a cover of glory.” This speaks of us. “Zion” is also an assembly: “But you have come to Mount Zion and to the city of the living God, the heavenly Jerusalem, to an innumerable company of angels, to the general assembly and church of the firstborn who are registered in heaven, (Hebrews 12:22).” The meaning of this terminology may elude some who do not know the background of the prophet’s words. But, to everyone he addressed, the message was clear. Isaiah the prophet came on the scene, and he said, “Look, the land is desolate. Rebellion is at an all time high. Sin has brought great destruction. Disease is prevalent. Disaster is on the way. But, there shall come “a Branch” that will be raised up. He began to prophesy a day that I believe is the day we are living in right now. They understood the promise that God was going to fill their houses with glory the same way He filled the Tabernacle of Moses and the same way He filled Solomon’s Temple. To Isaiah’s listeners, this meant far more than a religious experience or a religious place. It was the promise the presence of God would bring hope, healing, wholeness and happiness right where you live. The prophet was foretelling the possibility of homes like yours, and mine, being lit with the glow of God’s love, filled with the brightness of His blessings and defended by the fire of His glory to defeat any attempts of the adversary to come against us. I am persuaded that God is building a glorious church and our very homes will be lit up with the glory of God. We will look distinctly different from those around us because right in the midst of darkness we will be shining as bright lights in a dark place. Not only did Jesus forgive our sins, but He paid the price so the glory of God could be on our house. The term “house,” also speaks of relationships and describes the immediate circle of one’s family or intimate relationships. “As for me and my house we shall serve the Lord,” (Joshua 24:2, 15).” That is not describing brick and mortar, that is speaking of my kids and grandkids. Families and relationships involve far more than biological genetics; there are spiritual genetics, as well. God’s promise of glory on our house is intended to be understood as a promise with real and practical possibilities - that spiritual life and power may be transmitted through your family. As sure as your kids have your eyes and your hair, they can get your spiritual DNA out of your house. God wants to be in your business, careers, jobs, and schools. His glory will be where you work and in what you do. The term “house” also speaks of influence. All of us have a scope of influence far broader than our close relationships or our regular business associates. All of us have a sphere of influence far broader. Years ago a research organization sought to assess the ages of influence of individual people in different walks of life. The most striking discovery they made was not the enormity of the influence of highly visible persons. Rather, they were amazed at the surprising number of people influenced significantly by "the members of the community deemed ‘unimportant.’” Suddenly the term “unimportant” disappeared. Researchers found that in the course of one year even a virtually homebound, reclusive, and withdrawn individual made contact with more than fifty people. Many of these individuals were said to have left an impression on others sufficient to be gauged as "impacting." That is the same word used in Genesis where it reads, “God created.” He looked at chaos and darkness and sent his spirit to hover over it and cover it. And God said, “Let there be light. And there was light.” It is not about you fixing your chaos, darkness or problems. It is about asking the spirit of God to come and hover over your house. And God will create a covering and your house will be changed by the very glory of God. The pathway for this is praise. Psalm 22:3 describes this exchange, “God is enthroned on the praises of His people.” God has given us a sovereign will to choose and praise seats God in your house. It may seem presumptuous to say that human beings can do anything to "seat" God on His throne, since the sovereign Creator of the universe needs neither our assistance nor our approval to be enthroned. But there is a subtle truth often overlooked by those who would assert God's sovereignty so quickly that they forget our own. Some people say, “God is sovereign; He will do what he wants.” But that is not in the Bible. Yes, there is the sovereignty of God, but He has given us a will to choose. The biblical fact is that God has given each of us sovereign will. You have absolute control of your personal destiny and your own decision-making power has been placed within you. Thus, in any matters that concern us-including all facets of our "house"-we are in full dominion. (That fact is often at the root of our problems because we think we can manage our house by ourselves without God getting involved.) But here is God's powerful solution. The pathway of praise is the approach to life that opens the way for God to begin to move in, to fill our house with His glory. So we need to praise. I’m not necessarily talking about how we do it on Sunday morning. Thus, we have a need to praise, and there is a way to do it. 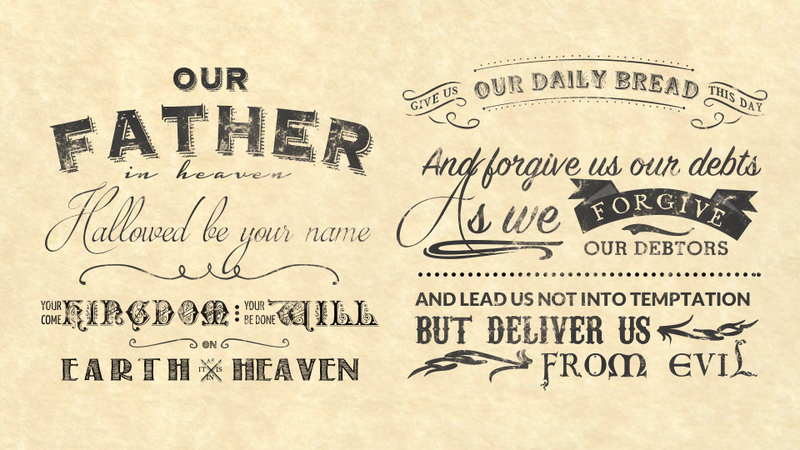 The need is so basic that Jesus included it in His prayer that He taught us to pray called the Lord's Prayer. In His pattern for our prayers asking for such things as daily forgiveness, daily provision and daily power to overcome, He said we should pray, "Thy Kingdom come, Thy will be done on my earth as it is in heaven." Sometimes we pray these prayers without thinking, and it loses its power. It’s like the words “grace” and “blessed” that have lost their power because people of how people use them. “Grace” isn’t something that happens before you eat. “Blessed” isn’t “God bless you” when you sneeze. In the Bible, these two words are powerful. If you ever found grace, it was huge; that means you had won the lottery. It says “Noah found grace.” Moses said, “I have found grace with God.” It means the blessings of God are beginning to overrun and overtake your life. If you ever got blessed, it was something weighty getting on you. That’s what happened to Abraham. Isaiah 51 reminds us, “Remember the rock from which you were hewn. How I chose one man by himself, blessed him and he became a nation.” It doesn’t tell us I chose one man and sent people to help him, educate him. It says I found one man and blessed him. “Thy Kingdom Come” means rule, lordship, and authority. This is not an idea about some mystical millennial future, as the tense is now. As with the rest of the prayer, Jesus points toward the pathway of worship-filled praise when He says Our Father in heaven (I thank You for that relationship You have given me through Your Son, my Savior, not some random father, my Father). Hallowed be Your name (for You are holy, and I worship You and revel in the beauty of Your completeness and excellence). Your Kingdom come (for there is no rule of my wisdom or of human working that can bring about Your peace, power and blessing, Your Kingdom is power and righteousness in the Holy Ghost, and I invite you to sit down right here, right now, on my family with that). Your will be done (because I bow in full submission to declare, as did Your Son, "Not My will but Yours be done"). That is where most of us miss it. We ask God to bless our will. No one has a problem believing heaven is in the will of God. That is why He said, “Pray this way.” Let Thy Kingdom come (not Thy Kingdom go), on earth as it is in heaven (for there is no question Your will is exercised where Your throne is established). Dr. Mark Rutland wrote a book called 21 Seconds to Change Your World. He said he was in the most disturbed, weary, perplexed place of his life living on earth in ministry. He was in deep dark depression after 40 years of ministry, and the enemy came to him and said “Got ya - you don’t even have a prayer now.” As soon as that happened, the Holy Spirit said, “Yes, you do. I gave it to you in Luke Chapter 7.” He said he did not feel anything; he just started praying the Lord’s Prayer and realized it took him 21 seconds. He started praying it every day and in a short period of time his whole circumstance shifted and changed. Jesus would not have said, “Pray this prayer,” if there wasn’t something in it so powerful that we should pray it every day of our life. So let’s start praying this 21 second prayer and evoke God’s blessing on our house. This is the season where God’s glory is going to be on your house. God said, “Over every dwelling in Zion there will be a covenant of blessing,” cloud by day to bring blessings, peace, anointing, and a fire to be there against any adversary to come against you or your family. God’s glory is coming to your house to bring divine order, peace, righteousness, joy, power and grace like never before.